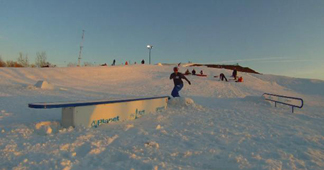 Some killer extreme snow fun opportunities await at Hawk Island Snow Park on Cavanaugh Road in South Lansing. While the Greater Lansing Sports Authority is mostly committed to bringing quality athletic events and tournaments to the area we just can&apos;t help the fact that this is a really solid area for outdoor activities for the winter season. As a four season community, we try to shine all year long of course, but as a northern destination we&apos;ve got parks and hills and special areas that come alive when the landscape is white and the temps are chilly. Whether its cross country skiing, snowboarding, snow-shoe expeditions, scenic walks, ice skating, sledding, tubing or snowmobile fun - its all right here at your fingertips. Our area abounds with Parks, many of which have dozens of winter offerings; set of beautifully with the snow we have right now. Check out sledding, cross country ski trails and snow shoe paths with shoe rentals at Fitzgerald Park, Fox Memorial Park, and Lincoln Brick Park in Eaton County. Ingham County Parks offer Hawk Island County Park, which offers an awesome new snow park that is unlike anything else around. Absolutely must be seen to be believed. Then the massive 540-acre Lake Lansing Park is packed with trails and open areas of all kinds as well as Burchfield Park in Holt. Tranquility is the theme at Fenner Nature Center come winter. A winter walk or day of snow show hiking will make you really appreciate a hot meal and a warm bed when you return home. Harris Nature Center and Woldumar Nature Center are also truly scenic winter spots that will bring you new perspective for 2013. So tons of outdoor winter fun, but it doesn&apos;t end there. Check out Munn Ice Arena, Suburban Ice East Lansing and The Summit Sports & Ice Complex for the best indoor ice skating in the state! Sports of all kinds thrive in Greater Lansing but winter sports opportunities are literally everywhere. Bundle up and get out!